No one stood on ceremony Friday night, as the British rock band Procol Harum reunited with The Edmonton Symphony Orchestra in the first of two shows. Lead singer Gary Brooker polished his patent leather shoes on his elegant trousers and yukked it up with the violins during a drum solo. Later, a capacity crowd sang Happy Birthday to him as his cake blazed with candles atop the grand piano. Affection and ease were the bywords as the recently-regrouped rock band returned to the stage where it performed a landmark concert and recorded a hit album nearly 21 years ago. "I think one of the reasons the Edmonton Symphony invited us back this time is because we're one of the cheapest bands in England," joshed Brooker, letting us know he understood we might be doubting a band that's not had a hit single since [sic] Conquistador was pulled from that 1971 ESO session. But the genial frontman and his tightly-rehearsed band delighted us with a program that made substantial use of the symphony and The Greenwood Singers. 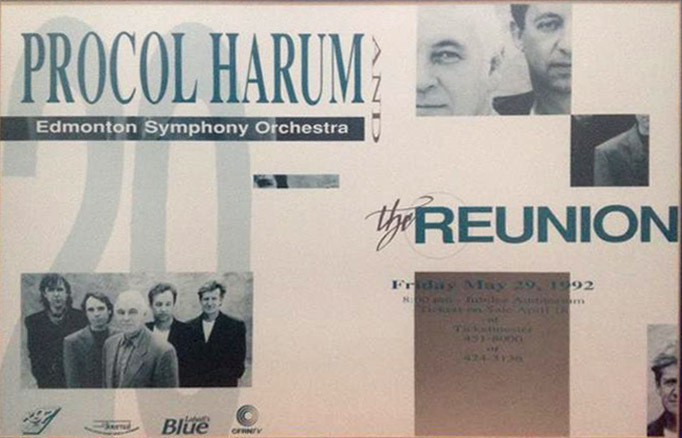 With such vintage material as Grand Hotel, A Salty Dog and A Whiter Shade of Pale providing plenty of openings for hearty brass and filigreed strings to communicate intricately nuanced emotional shifts, Procol Harum was instantly one of the better matches in the ESO's recent collaborations with rock acts. Armed with catchy, mainstream pop material the likes of Holding On and The Truth Won't Fade Away the band could have coasted through the show with a few flourishes of viola and double bass. Instead it introduced a dynamic and elaborate new rock tune called Into the Flood for this performance. Causing the violins to fly like spirited country fiddles, the choir to hit precise, gospel-inflected harmonies with gusto and the horns to dance with Geoff Whitehorn's lead guitar, it underscored how singularly innovative the sound is when rock and orchestra entwine. Bloopers were minimal (Brooker did appear to forget some words to Ghost Train) and the many cameras were unobtrusive. But for the fact that the ESO neglected to bring in enough recordings to sell, the show was a success.